Ambassadors of 13 Arab countries have gathered Tuesday in the Australian capital Canberra to voice their concerns over consideration by the government of Prime Minister Scott Morrison to move the country’s embassy from Tel Aviv to Jerusalem, a move that will recognize the city as Israel’s capital. The meeting agreed to send a letter of complaint over the move to the Australian foreign minister. “Any decision like that might damage the peace process … this will have very negative implications on the relations between Australia and not only Arab countries but many other (Islamic countries) as well,” Egypt’s ambassador, Mohamed Khairat, said in statement to Reuters. 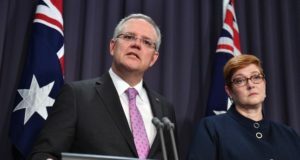 Morrison, an evangelical Christian, Tuesday said he was considering to move the Australian embassy from Tel Aviv to Jerusalem. The Prime Minister also argued the move would give a new turn to the stalled talks between Palestinians and Israelis over the fate of the city. “We’re committed to a two-state solution, but frankly, it hasn’t been going that well,” he said. The fate of the old city has been the main bone of contention between Palestinians and Israelis. Palestinians hope to make the eastern part of the city the capital of their future state while Israel claims the entire city is part of its territory. Israel in 1967 annexed parts of Eastern Jerusalem. Morrison has informed Israeli Prime Minister, Benjamin Netanyahu of his decision. Netanyahu welcomed the intention adding that he was “thankful”. Morrison’s decision opposes Australia’s traditional stand on the very sensitive issue. Canberra has always supported the two-state solution. Despite being a US ally, it distanced itself in December from the White House following Donald Trump’s decision to recognize Jerusalem as Israel’s capital. In May, the White House officially moved its embassy to Jerusalem in a transfer that caused the death of over 60 Palestinians killed by Israeli forces at one part of the fence between Gaza and Israel. Israel has so far failed to lure world countries to follow the US steps. Only Guatemala has walked in the footsteps of the Trump administration. Paraguay who initially announced a similar move, retracted giving a blow to the Israeli diplomacy. Posted by KanelkaTagba on Oct 16 2018. Filed under Uncategorized. You can follow any responses to this entry through the RSS 2.0. Both comments and pings are currently closed.